The poem is presented in eleven couplets, each one its own stanza, and each one inspired by a poet, writer, artist, or dancer. The poem is a commentary on the self image of American blacks and the way that they may be perceived by others of any race, including those of African descent. The first stanza directly quotes the dancer and choreographer Judith Jameson [sic, presumably Jamison]. The first person singular here is Jamison, not Wilson. Jamison (b. 1943) is the director emerita of the Alvin Ailey American Dance Theater. More information about her may be found here: http://www.alvinailey.org/about/people/judith-jamison. The second stanza refers to Elizabeth Alexander (b. 1962), the Chair of African American Studies at Yale. She was asked by Barak Obama to compose and read a poem upon the occasion of his inauguration. More about this essayist and poet may be found here: http://www.poetryfoundation.org/bio/elizabeth-alexander. Wilson refers to her book of essays, The Black Interior. Details about this book may be found here: http://www.amazon.com/The-Black-Interior-Elizabeth-Alexander/dp/1555973930. The third stanza considers Brooks, presumably Gwendolyn Brooks, the famous black American activist poet. Brooks was recently discussed in Songs of Eretz http://eretzsongs.blogspot.com/2014/01/review-of-because-it-looked-hotter-that.html. Additional information about her life and career may be found here: http://www.english.illinois.edu/maps/poets/a_f/brooks/life.htm. She wrote the poem "The Life of Lincoln West" which may be found here: http://www.poetryfoundation.org/poem/172096. Both Wilson, in his poem, and Alexander, in her book of essays, "consider Brooks." Particularly, all three consider what it may mean to the individual who has "classical," though some would say "ugly," negroid features. This thought carries through into the fourth stanza. The fifth stanza refers to June Jordan (1936 - 2002), the Caribbean American poet, playwright, essayist, and activist. Additional biographical information about Jordan may be found here: http://www.poetryfoundation.org/bio/june-jordan. Jordan felt strongly that black poets should write in "black" English. In the sixth stanza, Wilson indicates that he disagrees with Jordan but nevertheless understands her point of view. Wilson then refers to the Indian poet, novelist, and essayist Meena Alexander (b. 1951), the Distinguished Professor of English at Hunter College and the Graduate Center, City University of New York. Additional biographical information about her may be found here: http://www.poets.org/poet.php/prmPID/778. 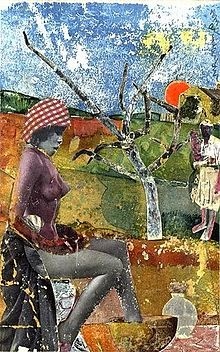 In the seventh stanza, Wilson refers to Bearden, presumably Romare Bearden (1911 - 1988), the African American artist, writer, and humanist. Additional biographical information about Bearden as well as examples of his artwork may be found here: http://www.beardenfoundation.org/artlife/biography/biography.shtml. Bearden was noted for his collages, one of which, The Calabash, is pictured. Reference is also made to Lawrence, presumably Jacob Lawrence (1917 - 2000), an African American painter whose career Bearden nurtured. More about Lawrence and his artwork may be found here: http://whitney.org/www/jacoblawrence/meet/. In the eighth stanza, Wilson introduces Fanon, presumably the Marxist, Frantz Fanon (1925 - 1961), best known for his involvement in the struggle against France for the independence of Algeria, the country of his birth. Additional information about Fanon may be found here: http://www.iep.utm.edu/fanon/. Wilson makes a pun on Fanon's name. In the ninth stanza, Wilson quotes a passage of Beloved by Toni Morrison (b. 1931), an African American novelist, editor, and professor who received the Nobel Prize for Literature in 1993. Additional information about her may be found here: http://www.tonimorrisonsociety.org. A review of Beloved appeared in Songs of Eretz on December 16, 2012 http://eretzsongs.blogspot.com/2012/12/review-of-beloved-by-toni-morrison.html. The tenth stanza brings up Brooks again, and the final stanza refer to the Fisk University Second Black Writers' Conference which Brooks attended in 1967. Her attendance was a turning point in her career which thereafter was deeply involved in activism and the Black Arts movement.